Ulrich Vogl’s Slide Projector Cityscape « Adafruit Industries – Makers, hackers, artists, designers and engineers! There are 14 slide projectors that are standing next to each other. Each one has a slide with a piece of ordinary tin foil in it, in which I made holes with a small needle. The light goes through the holes and hits the wall. What appears is a kind of cityscape, like standing on a hill in Rome and looking over the city – or flying onto Los Angeles. Even though all the projectors use the same type of lamp – the light colour that hits the wall differs from machine to machine – from very white to quite yellow. Very similar to the different kind of lights in a city. 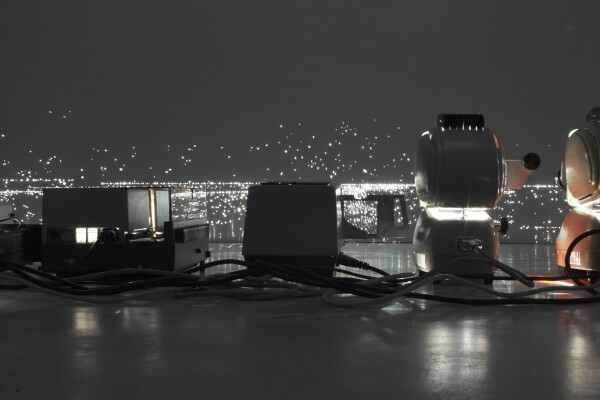 The ventilation of all the projectors together produce a permanent but somehow distanced sound. 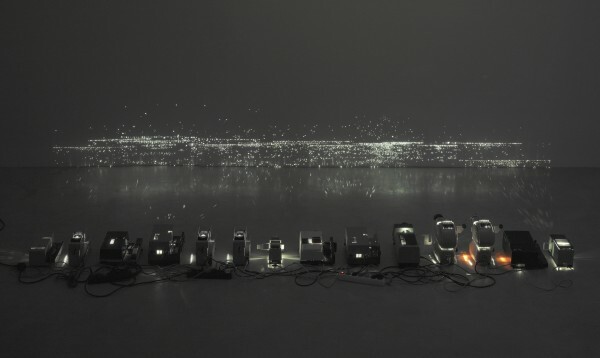 It is almost a romantic scenery – but there is the line of projectors between the image and the viewer. The ventilation sound that could be quite annoying turns into something soothing. The piece draws you in like a film – but unlike a film it always keeps you very aware of what it is, since the “making of” is always part of the piece. In an exhibition this sort of equilibrium between film and a sculpture is what I am looking for.